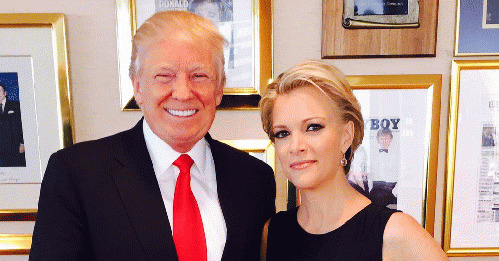 Fox News' combustible feud with Donald Trump began with a bang last August when Megyn Kelly pressed the candidate on his ugly history of misogynistic language. The hostilities ended with a whimper though, when Kelly last week obediently walked Trump through the now-infamous softball (or "airball") interview as part of her first Fox Broadcast special. Media observers have been lining up to describe just how awful and boring and disappointing Kelly's sit-down with Trump was, especially after she had made the media rounds promoting herself as a strong, independent journalist who wasn't going to be intimidated by Trump. Instead, she practically bowed in Trump's presence and produced the kind of "journalism" that Fox News is famous for -- The New Yorker called the interview "a useless exercise, except, perhaps, for those watching from one group: Republicans looking for a script for how to surrender to Donald Trump." Professionally, Kelly's wilting performance may have set back her dream of becoming the next Oprah or Barbara Walters; of breaking out of the Fox News conservative media word and establishing herself as a TV brand that can appeal to huge swaths of viewers. And maybe bank $20 million annually. While Kelly huddles with her manager and agent and tries to figure out what went wrong after a long-running media love fest, the larger story that's come into focus is how Fox News, led by Kelly's genuflection to Trump, has signaled its institutional surrender to the presumptive GOP nominee. Fox News has been bullied and beaten into submission by a Republican front-runner who had the audacity to pick a fight with Roger Ailes and the mass media mouthpiece of the Republican Party. Sure, holdouts like Charles Krauthammer, Stephen Hayes and Greg Gutfeld remain staples on the Fox News lineup; holdouts who have dismissed Trump as a conservative joke for months. But their numbers, and certainly their sway, seem to be shrinking as the cable channel clumsily and belatedly maneuvers itself into its traditional campaign role: a cheerleader for, and ferocious defender of, the RNC. Like much of the Republican Party, as well as large portions of the conservative movement, Fox News is fumbling its way onto the "acceptance" mark as it comes to the final stages of its weird grieving process over the Trump nomination. Eight in 10 Republican voters now want party leaders to rally behind Trump, according to the latest New York Times/CBS poll. On paper, Trump and Fox seem like a perfect fit since both celebrate bigotry and embrace a kind of divisiveness-on-steroids approach to attack politics. But Fox isn't used to being pushed around by politicians, let alone by the presumptive Republican Party nominee. "By mid February, [Fox's] perception by Republican adults 18 and over had reached its lowest point in more than three years, and has declined by approximately 50% since January of this year. Coinciding with Trump's rise to front-runner in the GOP presidential race, Fox News Channel has seen its perception by Republicans slide." Today we look at the capitulation landscape and think, well of course Fox News was going to surrender to Trump, right? Fox always backs the GOP front-runner. That logic makes sense today. But how quickly we forget the unprecedented brawl that played out for the last nine months, as Fox routinely found itself stumbling and bumbling; one moment supporting Trump and the next moment angrily lashing out at him.